Oh boy, where to start? To say that this was an eventful twelve months in the StarCraft scene would be the understatement of the year. It wasn’t all great, but let’s rewind to January and start working our way through the highlights of 2016 in a chronological order—after all, we’ve had enough chaos this year. Legacy of the Void had just been released and everyone was buzzing to see the best players in the world figure out how to play it. Naturally all eyes were on the Global StarCraft II League and the SPOTV Starleague in Korea. Park “Dark” Ryung Woo, whose first big triumph had been long in the making, finally took home his first championship—SSL Season 1. Even with players like “ByuN” Hyun Woo, Kim “Stats” Dae Yob or Kang “Solar” Min Soo in the competition, Dark proved that he was a step ahead of everyone in the tournament, dropping only four maps on his way to the championship. You would think that at this point he would have been considered the best in the world by most. Yet that title went to Joo “Zest” Sung Wook for the first half of 2016. 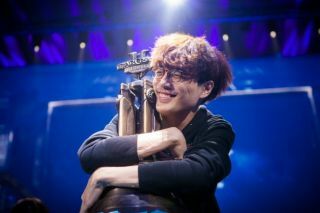 In Season 1 of the GSL, Zest had lost a grand total of one map before reaching the Grand Finals, where he defeated his team-mate Jun “TY” Tae Yang 4-2 to win his third GSL trophy after previous victories in 2014. What made his win so impressive, though, was that he defeated the best of each race, bar Dark himself, convincingly. All the while his winrate against Terrans stayed around 90%, an absurd number considering the opponents he defeated to reach it. With a new WCS system in place that separates Korean and international competitors, a whole new set of storylines developed in the tournaments outside Korea. A few players began to emerge as favorites to win the big WCS competitions and claim the title of Best Foreigner. Artur “Nerchio” Bloch, Tobias “ShoWTimE” Sieber, Jens “Snute” Aasgaard and Alex “Neeb” Sunderhaft stood out as the most consistent performers in the foreign scene and each of them have by now won a Premier tournament. The level of play in the international ranks has also risen noticeably compared to previous years. The closer we came to the end of the year, the more hopes fans had for the first Global Events of the year, in which international and Korean players would finally compete against each other. Season 2 of the GSL and SSL saw two new champions lift their first Korean trophies. The fairy tale of ByuN turned heads from all around the world. The first teamless player to win a Korean StarCraft league —the GSL Season 2— did so after years of re-inventing himself as a player and person. He had come close in 2012, but had taken suffered a devastating loss that appeared to throw him off the competitive rails entirely. But ByuN recovered and, years later, returned to win the trophy that had always eluded him. Even though he naturally stood out, a very similar story happened in the other Korean league at the same time. Solar, who had always been unlucky to be overshadowed by another dominant Zerg player—first soO in 2014, then Life in 2015, then Dark in 2016—and had also gone close to reaching Korean gold finally broke through all these barriers at once. Defeating Dark 4-3 in a thrilling series, he won Season 2 of the SSL. This would have been the biggest news story of the year if not for the one below. A non-Korean won a Korean tournament. A non-Korean with only a personal sponsor, no team, won a Korean tournament. If you thought that ByuN’s win was big—it was. But this was bigger. The last time something like this happened was 16 years ago, when Guillaume "Grrrr..." Patry won the Hanaro OSL in 2000. Neeb was two years old at that time. Neeb played himself into a frenzy, taking out one big name after another. Especially his Protoss vs Protoss matchup shone through as one of, if not the best in the world. Neeb won his opening group—containing the two GSL Champion Zest and ByuN—with a 4-0 score. He then kept his cool against the extremely aggressive Zerg Pet and overcame SSL Season 1 Finalist Stats 3-1. By the time he faced Cho “Trap” Sung Ho in the finals, he had already done the unthinkable. But Neeb didn’t stop there and emphatically dispatched of Trap 4-0 to complete an accomplishment that not a soul in the entire scene would have thought possible at the beginning of the year. If only the year had ended there, huh? Unfortunately the biggest talking point of 2016 was an announcement made by KeSPA and the consequences it brought. On the 18th of October, KeSPA announced that Proleague, one of the most storied competitions in esports, would be discontinued after 14 years. The fallout was immense. Almost all Korean teams closed the doors of their StarCraft II divisions. SK Telecom T1 , KT Rolster, Samsung Galaxy, CJ Entus, MVP and Afreeca Freecs all disbanded their StarCraft rosters and left the community in shock. The future of the Korean scene is still unknown, although the GSL will continue in 2017—the SSL will also be discontinued. Fortunately the year didn’t end on that note, either. After it became known that the Korean scene was largely up in the air, the community’s collective nerves were soothed by the annual Global Finals of WCS at BlizzCon. There’s something special about that tournament. No matter how dire the news had been in weeks prior, spirits always get lifted by BlizzCon. There’s a buzz around the StarCraft scene that’s incomparable to any other time of the year. Expectations were high after last year’s dream finals between the two previous champions, sOs and Life. 2016 delivered with another dream scenario, as ByuN met Dark in the Grand Finals—the match everyone had eagerly been waiting for. After an exhilarating 4th game—if you haven’t seen it yet, you should—and a series played at the highest level currently available in StarCraft II, ByuN came out of the booth as World Champion of StarCraft II. The Cinderella story was complete. After the collapse of Proleague and a turbulent few weeks, we’ve all had time to breathe a little. Homestory Cup served as the perfect way to end the year on a high, and a few Korean players who were left with no idea where to go next have already found new homes. Online tournaments have been absolutely stacked with talent, as these players are no longer restricted by their teams. 2017 promises to be just as exciting as this year. Hopefully we won’t have quite as many apocalyptic headlines.